BlindAid is a portable tool that reads Braille and signals close objects.� It is ideal for those unfortunate people who just turned blind and have not mastered Braille reading and blind cane usage. It can also be used as a learning instrument that helps the user decipher Braille without constantly going to the Braille dictionary. Since most Braille we see on the street has standard size.� Instead of image sensing, we decided to use 6 push buttons in a 2x3 matrix.�� When the buttons are pressed against the Braille, the buttons corresponding to the bumps on the Braille will be pushed. The push button design not only makes our project more simple and elegant, it also makes it more affordable to the blind people. Since our product is targeted to blind people who didn�t master the Braille reading, we assumed they are new to the blind walking stick as well. Therefore, we attached an IR sensor to detect whether there is any object close to the user, in hope to reduce the chance of any unfortunate collisions. the horizontal and vertical spacing between dot centers within a Braille cell is approximately 0.1 inches (2.5 mm); the blank space between dots on adjacent cells is approximately 0.15 inches (3.75 mm) horizontally and 0.2 inches (5.0 mm) vertically. Since it is hard to recognize word by just hear its spelling. We implemented our BlindAid such that when a full word is inputted, it will pronounce the word when �speak� Button is pressed. In order to increase the range of words the reader is able to pronounce, we decided to use allophones for speech generation instead of pre-recorded voices. When expanding the memory size for the larger dictionary, the time it takes to load entries from the dictionary onto the chip also increases proportionally. Fortunately, once the data is written on to eeprom, it remains there so the data from the dictionary only has to be written there once. Our project conforms to all IEEE standards to the extent of our knowledge. Protoboard � This is the skeleton of the BlindAid. It holds the Mega32 and supports links to other components. 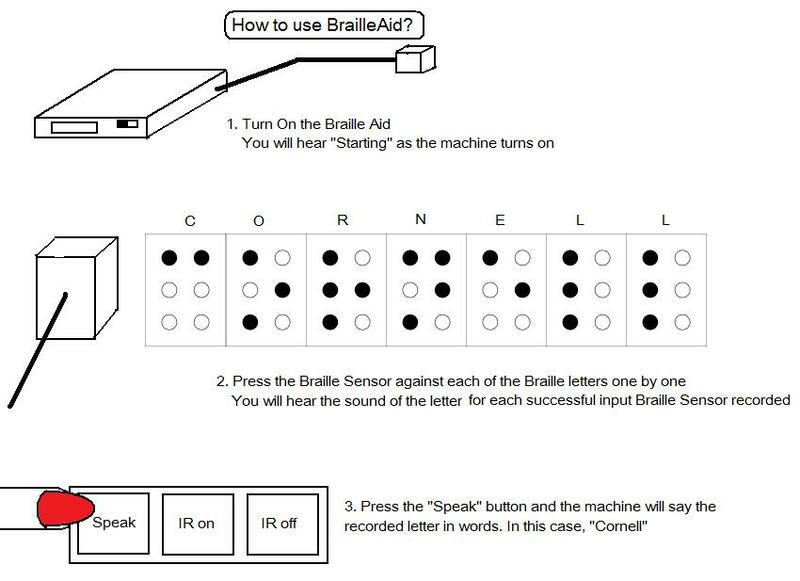 SpeakJet �This is the messenger between the microcontroller and the user.� Whenever a button is pushed or a Braille is read, the SpeakJet will generate a robotic voice and deliver a message to the user to make sure the user is updated with his/her surrounding. Headphone � In ear design, so clear sound can be transferred to the user without too much lost from noise. 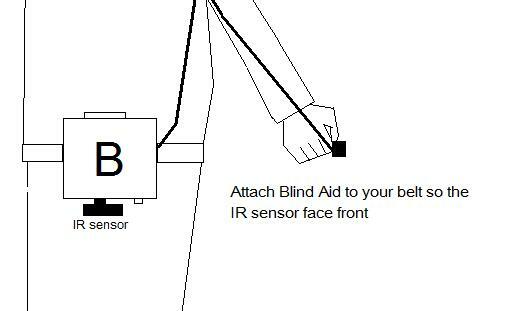 IR Sensor � The user�s guard dog. It generates a warning message to the user when the user gets too close to a wall in front of him/her. Braille Sensor � A combination of 6 NKK buttons. This is like user�s eye. It converts Braille to Binary data. (B2B) So the MegaL32 can process the data. The SpeakJet chip can be setup up in two ways. One for Demo/Test Mode and one for serial control. In demo mode, the chip outputs random phonemes, both biological and robotic.� We initially setup the chip to run Demo Mode in order to test it out.� Afterwards, we connected the chip to the serial interface.� We found that the lowpass filter indicated were unnecessary because the signal was clean and the lowpass filter only reduced the volume.�� Serial Data is the main method of communicating with the SpeakJet.� The serial configuration to communicate with it is 8 bits, No-Parity and the default factory baud rate is 9600.�� These are the same settings used to communicate with the STK500 board.�� The Serial Data is used to send commands to the MSA unit which in turn communicates with the 5 Channel Synthesizer to produce the voices and sounds. As the project progressed, we realized that in order to make a quality speech generation system, a vast library of words and their pronunciation is needed. The onboard flash memory is only 32kB.� Assuming each word takes 8 bytes and its corresponding allophone takes 16 bytes, we can fit only about 1330 word. This is definitely not enough for speech generation. So we decided to use a 2MB eeprom. With that, we can store about 22182 words, which should cover most of the word we use in daily speech and some uncommon words. By the time we bought the 1mbit eeprom, we already had SpeakJet setup and functioning. For the sake of time and simplicity, we decided to keep the usage of SpeakJet instead of storing allophone in the external eeprom and use that for speech generation. We used a 2000K Ohm resistor on each of those wires for pull-up purposes. 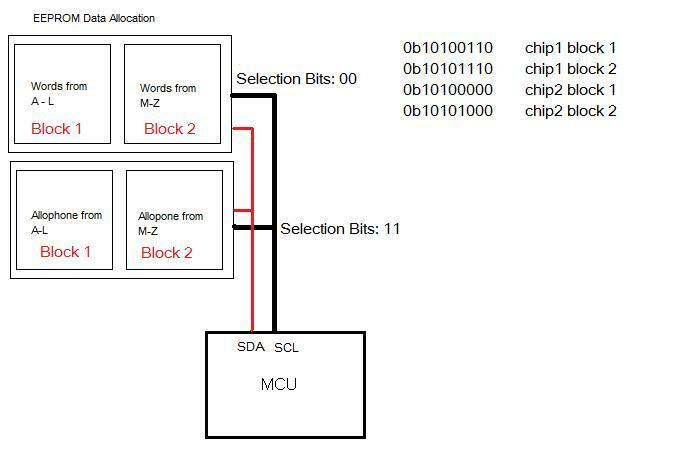 TWI requires frequent MCU/EEPROM communication.� Every time a signal is send from MCU to EEPROM, an acknowledge signal from EEPROM back to MCU is required. Writing to EEPROM takes a long time for writing. Luckily, we will never have to write to EEPROM once the dictionary is established. Therefore the long writing time doesn�t affect our project. We borrowed most of our TWI code from AVR library. AVR came with a neat TWI library called �i2c.h�, which we used for byte write and byte read. We decided to use 2 separate power sources because the IR sensor drains a lot of currents from the power source. Thus creates a lot of noises for the SpeakJet and worsens the sound output. In order to pronounce the words that are not in our library, our MCU will divide the input word into existing words. It would break the unknown word down by finding the longest existing word from our library that matches with the prefix of the unknown word. For data storage, we put all words in a single character array with �*� between words to indicate where words start and stop. We picked this design over double character array because double character array requires same length for each word.� So the shortest word �a� will have to take the same amount of space as the longest word in our dictionary. However, the single array made binary search impossible. We have to use linear search. In order to save time with searching, we arranged the words in our dictionary in alphabetical order and recorded the position for each of the 26 letters in the alphabet. So instead of traverse through the entire library for searching, it will only search words that match the first letter. To aid us in developing our speech, we used the Phrase-A-Lator software provided on the Magnevation website.� The software allowed us to test out the sounds, phrases and different control functions for the SpeakJet.� The software allowed us to adjust the volume, pitch, speed, and bend.� It was also used in helping us verify that the output control signals that we were using were correct by comparing the output signals from our program to that of the Phrase-A-Lator.� The software was easy to use.� To use the software, an audio amplifier must be connected to PortD.1, and the chip to RXD port of the RS232.� After selecting the correct serial port connected to the STK500, the program was ready to go. After some research, we discovered the CMU dictionary provided by Carnegie Mellon University for research purposes.� The dictionary contains over 125,000 North American English words with their transcriptions.� The dictionary uses 39 phonemes in its transcriptions. The 39 phonemes used in transcribing the CMU dictionary do not directly correspond directly to the 72 biological phonemes provided by the SpeakJet so some conversion was needed. K�� => 'KE', # EK? P�� => 'PO', # PE? Rather than manually write all 125,000 words in the CMU dictionary and their phonemes into the array format that we need.� We wrote a program in JAVA using the I/O functions to read and convert the dictionary.� We used the PrintWriter and PrintReader class to parse the dictionary line by line.� The Scanner class was then used to break up the line into tokens.� The format of the dictionary was the same throughout the dictionary.� The first token of each line was the word in the dictionary and all other tokens on that line were the transcriptions.� The words and sounds were all separated into different arrays and stored in different files based on their first letter.� This resulted in 52 different files.� These arrays could then be loaded into the eeprom one by one. We learned a lot from this project.� If we had more time, instead of using the SpeakJet chip, we could have implemented the allophones into the flash memory or eeprom instead of requiring a separate chip.�� This would have been cheaper.�� One mistake we made was placing all the devices into a single small container.� This resulted in the devices shorting each other out.� We should have insulated each device from one another better.� For easy of use, we would have liked to image processing to read the Braille.� This would have cost more but would have made the device for flexible in use.� This would also have saved a lot more money than buying a retail Braille reader which costs $1,400. There were not any conflicts of interest in this project. As far as we know, our project was quite unique from any other groups.� We were happy and willing to discuss any similarities our project may have shared with another group�s. All our data and estimates are accurate to our knowledge.� Any errors were completely unintentional. The subject of bribery never came up but we would have rejected it if it did. We were able to better understand the subject of speech synthesis and the SpeakJet chip and its potential use in aiding the less fortunate. We tried to improve our understanding of our subject by doing research and reading datasheets. We did not attempt anything we felt we were unqualified to do. We do not discriminate against any race or group.� We were happy to aid anybody who needed our help or advice. We tried our best to avoid injuring person or group.� Our device was intended to help and not hurt anybody as long as it is properly used.